The rate of population growth fell in 2016 in California and the nation. In California the population grew at a rate of 0.66% in 2016, down from 0.81% in 2015. The nation’s growth rate was also lower at 0.53%, down from 0.79% in the previous year. California’s population growth was due mostly to births and in small part to an increase in the migrant population arriving from outside the U.S. More births and a higher immigration rate translates to a rise in household formations in the coming years. Updated November 1, 2017. Original copy posted July, 2009. 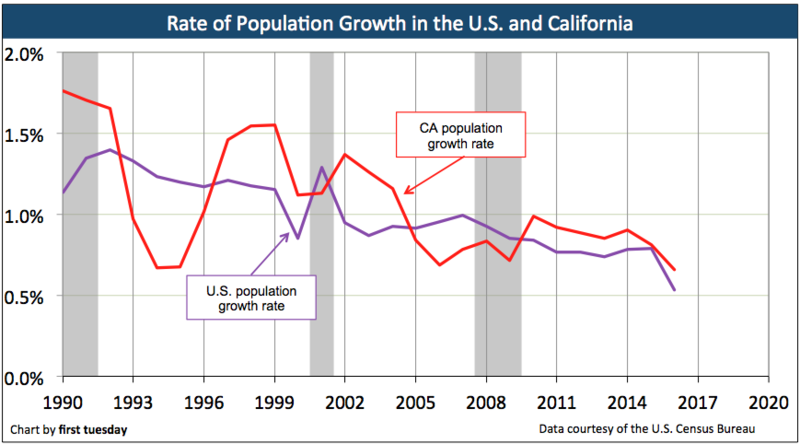 Population estimates from 1990 to 2015 show the percent change in population for California and the U.S. 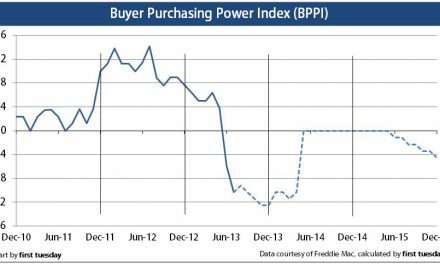 While both populations continued to increase throughout this period, the rate of increase has fluctuated and cumulatively slowed. Since 2010, California’s population has increased at a quicker rate than the nation. This is due to an increase in births and immigration. International immigration has increased over the past few years. In fact, California receives more international migrants each year than any other state. However, domestic migration has actually been negative, as more leave California than those who move here from other states. This is good news for agents. More births means an increase in household formations. Agents can capitalize on this knowledge by focusing FARMing efforts on renter populations.